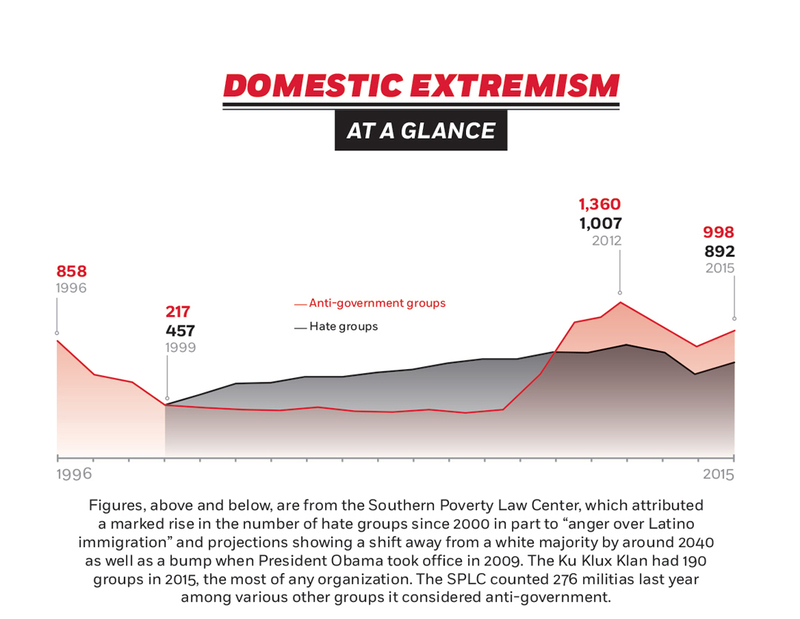 increasingly diverse picture of Islamic-inspired extremism. On a Wednesday morning in December, Syed Rizwan Farook and his wife Tashfeen Malik put their 6-month-old daughter in the care of Mr. Farook's mother and left the house for a day that would be burned into the history of terrorism on American soil. Mr. Farook, born in Chicago and raised in southern California, left the two-story townhouse the couple rented in Redlands, Calif., 10 miles outside San Bernardino, to join coworkers at a holiday potluck. A graduate of California State University, San Bernardino, and brother of a decorated Navy man, Mr. Farook worked as a restaurant inspector for the California Public Health Department. He met Ms. Malik on a Muslim dating site. She was born in Pakistan, raised in Saudi Arabia and studied pharmacology. Her traditional Sunni faith appealed to him. She came to the U.S. on a "fiancée visa," a K-1. They married and lived a quiet suburban life until Dec. 2. Mr. Farook, 28, excused himself from the work party and returned a short time later with Ms. Malik, 29. Ms. Malik had posted on Facebook her loyalty to the Islamic State, or ISIS. Together, wearing masks and black tactical gear and wielding combat rifles and handguns, they opened fire on the party, killing 14 people and wounding 21 others. The San Bernardino shooting spree was the deadliest act of terror on American soil since 9/11, and while the bloodshed was horrifying, the circumstances weren't a complete surprise to those who had been paying close attention to how violent extremism was taking shape in the United States. One day before the shooting, The New York Times ran this headline: "ISIS Followers in U.S. Are Diverse and Young." The story detailed the findings of a report by GW's Program on Extremism that painted a picture of American ISIS followers that this young, suburban couple fit into well. ISIS followers in the U.S. tend to be young, mostly male but increasingly female, the report found. They're active on social media and are spread across the spectrums of race, age, class and background. The vast majority are U.S citizens or permanent residents. The report, ISIS in America, made headlines across the country and around the world. In the days after San Bernardino, it gained even greater attention as the nation struggled to understand how a seemingly mild-mannered couple, well integrated into American society, could be secretly planning a bloody attack. The tiny think tank in downtown D.C., in an office building upstairs from a fast-casual restaurant, became a go-to source for understanding domestic terrorism and how otherwise ordinary people become radicalized. The report was based on a sixmonth study in which researchers mined thousands of pages of court documents related to 71 ISIS-related criminal cases, monitored hundreds of social media accounts and combed through media reports. "The timing was right for the report to get a good look," says Seamus Hughes, 32, deputy director of the Program on Extremism. "No one else had done this kind of comprehensive look before." The Program on Extremism began in June 2015 under the Office of the Vice President for Research's Center for Cyber and Homeland Security. 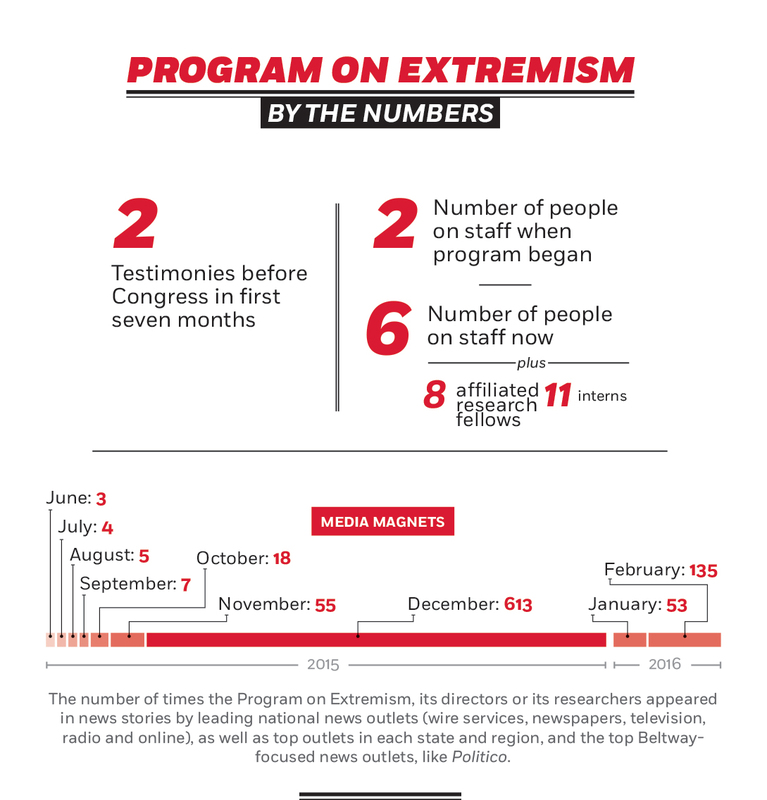 As the center focused more closely on cyber security, the Program on Extremism was created to examine domestic extremism, including terrorists and their allies who have not engaged in violent acts. That includes everything from ISIS sympathizers to white supremacists, although the program's staff is composed of Islamic extremism experts. Director Lorenzo Vidino, 39, has spent 15 years studying Islamic extremism in the West. A native of Milan, he came to the Program on Extremism after holding positions at Harvard University's Belfer Center for Science and International Affairs at the Kennedy School of Government, the U.S. Institute of Peace, the Rand Corp. and the Center for Security Studies in Zurich. Mr. Hughes worked at the National Counterterrorism Center, helping to implement efforts to counter violent extremism. 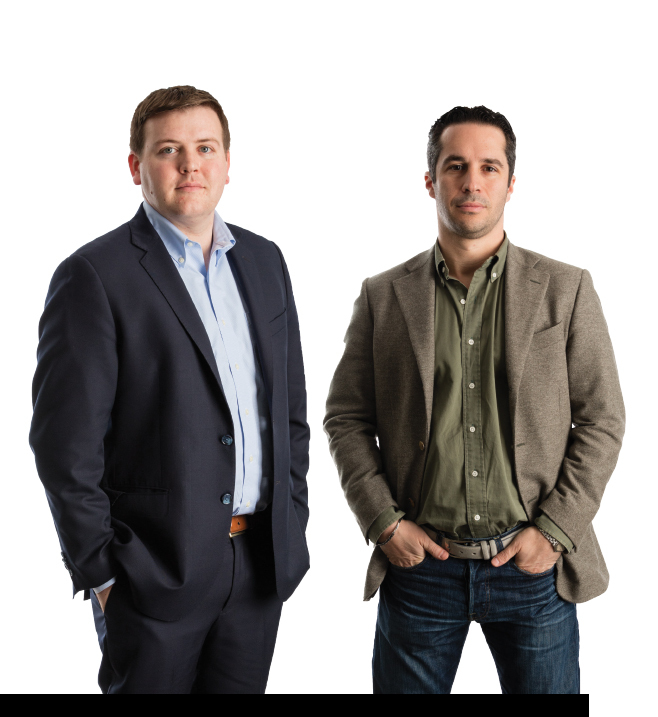 From those two, the staff has grown to six, including researchers studying emerging extremist groups in Egypt and the Middle East and the radicalization of women; they've also added eight affiliated research fellows and almost a dozen interns. Since its beginning, the group has drafted a number of papers that shed light on Islamic extremism, right-wing extremism and strategies to prevent radicalized extremists from turning violent. 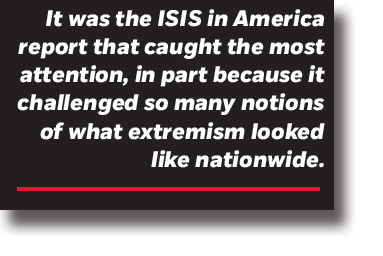 But it was the ISIS in America report that caught the most attention, in part because it challenged so many notions of what extremism looked like nationwide. Their goal has been to inject data into a debate driven largely by fear and to paint a nuanced picture of a polarizing subject. 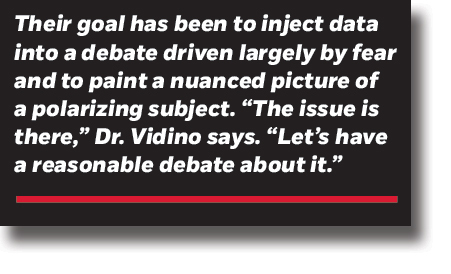 "The issue is there," Dr. Vidino says. "Let's have a reasonable debate about it." The message they present is a complicated one. In the paper Countering Violent Extremism in America, the program declares that the threat of homegrown Islamic terrorism in the U.S. "is relatively low." But in ISIS in America, it describes its rise as "unprecedented." Both can be true, but they don't make for easy points in a political debate. "It doesn't fit on a bumper sticker," Mr. Hughes says, but that approach, "nuance based on data," is crucial, he says. "If you develop programs out of fear, they won't be successful," he says. The facts of extremism can be very different than the perception and addressing it effectively can involve more cooperation than crackdowns. Prior to the San Bernardino shooting, the number of Americans killed by white supremacists and other anti-government radicals since 9/11 far outnumbered those killed by Islamic extremists. Now, those numbers are about equal, Mr. Hughes says. Yet compared to Europe, the United States' problems with Islamic extremism seem minor. In July 2015, the Office of the Director of National Intelligence estimated 250 individuals from the U.S. had traveled or attempted to travel to Syria to join the fighting there. Some 5,000 Europeans are estimated to have joined the ranks in Syria and Iraq. Yet the number of ISIS sympathizers in the U.S. is growing. In May 2015, FBI Director James Comey said ISIS-related investigations were running in every state in the country, as "hundreds, maybe thousands" of ISIS sympathizers emerged. "You see those documents? Those are court documents," Mr. Hughes says, pointing to a bookshelf in his office packed with binders—criminal complaints, indictments, affidavits and courtroom transcripts from the more than 7,000 pages that came out of what, by late February, had grown to 84 cases brought against suspected ISIS supporters over the past year. On one of those shelves sits a photograph of his grandfather, a D.C. police officer killed while trying to arrest a robbery suspect. "I have an affinity for police officers and public safety officials who put their lives on the line," he says. On the opposite wall, images of terrorism suspects fill a corkboard, connected by a web of string like something out of a cop drama. "We wanted to look at ISIS recruits in the United States," says Mr. Hughes, who was drawn to studying terrorism by a curiosity about what attracted people to such radical ideologies. "A lot of people had been talking about it but nobody had taken a comprehensive look at it." The portraits of those sympathizers defied the expectations, based on previous generations of Islamist extremists, of middle-aged Muslim men, isolated and adrift in this country, raised on a fundamentalist interpretation of Islam. They defied just about any expectations at all. 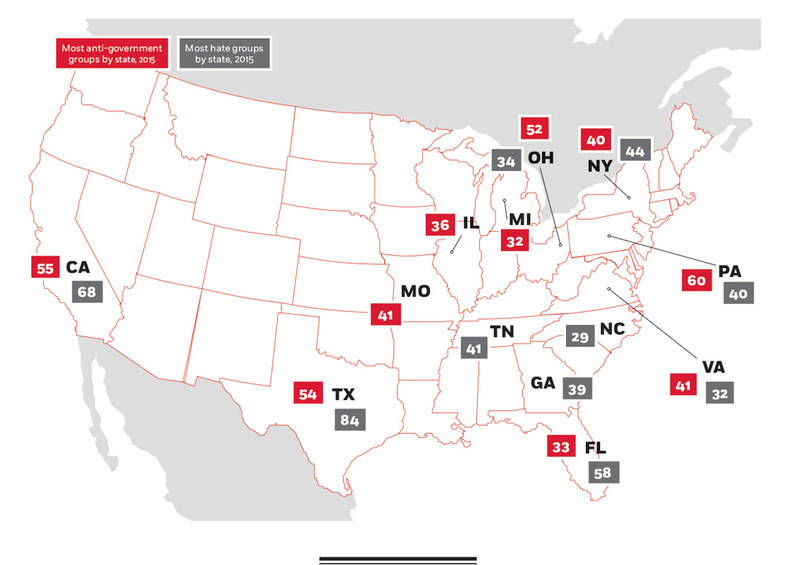 The average age of people arrested for ISIS-related activities was 26. The youngest was a 15-year-old boy. Eighty-seven percent were male, but women were playing an increasing role. The vast majority were citizens, or in a few cases, permanent residents. Nearly 40 percent were converts to Islam, not people raised in the faith. It's a mixed group, "defying a cookie-cutter profile," the report says. Some are grown men who had been tempted by jihad for over a decade. One was the son of a Boston-area cop married to a single mother of two young children. The suspects included the 22-year-old son of an imam about to start graduate school and his 19-year-old bride, a former cheerleader and daughter of a Mississippi police officer, studying chemistry in college. In this diverse crowd, a college-educated San Bernardino food inspector and his new wife do not stand out. "It's difficult to find one answer as to why people radicalize," Dr. Vidino says. His group's next step is to find what answers they can. They have embarked on an ambitious project to interview people who have been radicalized and, in some cases, arrested for terrorist-related activities. Some have reformed and are looking for redemption. Others remain in the throes of jihadism and are hoping to spread their ideologies. "Most of them are American," Dr. Vidino says. "They are native speakers. They use slang. They have the same kind of interaction on social media that all American kids have, but they happened to be in this bubble that discusses ISIS." Around Dr. Vidino's office are maps of his native Milan, where he watched many of his Muslim neighbors take up arms to join the fight in Bosnia in the 1990s. The imam at the neighborhood mosque was the leader of the foreign fighters in Bosnia, and, as Dr. Vidino watched criminal investigations and media reports target his neighborhood, he became fascinated by the growth of Muslim extremism. "If you want to understand why people radicalize, there's no better way than to get it from them," he says. One commonality among them all, Dr. Vidino says, is the powerful message that jihadi groups provide and the promise they offer to supporters to be part of something bigger than themselves. The individual motivations can range widely, from a thirst for revenge to sympathy for Syrian refugees, the ISIS report says, but the motivation underlying most of them, Dr. Vidino told the Senate Homeland Security committee in January, "is that of living in a perfect Islamic society under the world's only authentic Islamic government," as followers see the ISIS caliphate. That allure spreads on social media, especially on Twitter, where ISIS reaches potential recruits who otherwise would be out of reach, and where would-be supporters find jihad can be just a keystroke away. That's one reason ISIS seems to be reaching younger people who are computer savvy, researchers say, and why women find it easier to join the ranks and evade the separation of sexes that kept many women out of past jihadi movements, where leaders didn't welcome women's participation. "You can't build an Islamic state with just men," says Audrey Alexander, BA '14, a research fellow at the Program on Extremism, who specializes in studying the radicalization of women. While ISIS hasn't welcomed women on the front lines, it has encouraged women to take on roles in recruiting, spreading propaganda, marrying jihadists and raising children in the group's ideology. "The mass media really doesn't take them very seriously," Ms. Alexander says. "That's a huge problem because it undermines our ability to prevent women from joining." Women seem to join with the same mix of political and personal reasons that men join, Ms. Alexander says, and social media has allowed young women to "try on a new identity" as Islamic extremists from the safety of their computer screens. "With the use of social media, it essentially lowers the bar for people to be able to reach or radicalize or recruit online," Mr. Hughes says. "It's essentially the democratization of terrorist recruitment. If you're a 20-something young woman from Philadelphia, you can reach out to a number of people and try to join ISIS in ways you wouldn't have been able to before." The Program on Extremism has outlined a network of social media players. Some are "nodes," core content creators who swap comedic memes, post news articles and send out official ISIS tweets. Some are "amplifiers"—either real-life sympathizers or automated accounts that retweet and "favorite" ISIS material. Others are "shoutout" accounts that introduce new pro-ISIS accounts and announce the accounts of suspended users who have switched accounts. A recent white paper by the Program on Extremism found that suspending ISIS accounts succeeded in slashing their follower counts. Yet as Twitter cracks down on ISIS accounts, supporters have sought other social media platforms, like Telegram, a highly encrypted messaging platform popular among terrorist groups and dissidents in authoritarian countries, and a platform increasingly popular in the United States. Mr. Hughes pulls out his cellphone and opens the Telegram app, where he finds an American woman in Syria giving daily updates about life on the front lines. Research fellow Mokhtar Awad says he understands the allure. As a Muslim teen growing up in the United States, he says, he would find Islamic fundamentalist messages online proclaiming the glory of long-gone caliphates that stretch back to the seventh century and the early days of Islam. The notion of rekindling a bygone era of glorious Islam was appealing, Mr. Awad says. "Really, fundamentally, these people believe they are making a better world," he says. "What protects you from going down that path is accepting the world as a diverse place. It's accepting progress." Much of Mr. Hughes' experience is in countering violent extremism. It's a nascent field, but one communities are slowly turning to as they realize it may be more effective to stop terrorism before it starts. A few places, like Montgomery County, Md., are creating programs among police departments, mosques and Muslim communities to identify people being radicalized and steer them away from extremism. 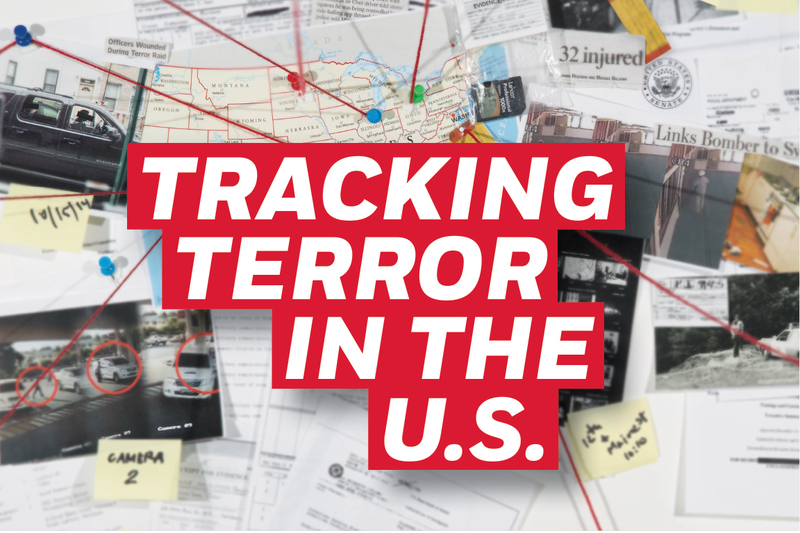 Following the 2013 Boston Marathan bombing, Boston, Los Angeles and Minneapolis-St. Paul took part in a White House pilot program to test "countering violent extremism," or CVE, strategies. Already in practice in several European countries, these CVE programs are designed to allow family members or community members to alert authorities about young people who are radicalizing but haven't committed a crime. Instead of launching a criminal investigation, authorities can work with families and religious communities to intervene. These programs have been criticized by some Muslim and civil liberties groups as government overreach, but others have embraced them as a way to keep young people who may start putting out questionable tweets or reading radical propaganda from turning violent. "If you look at the cases," Hughes says, "a vast majority of them had a bystander effect, where family members or loved ones saw something that was concerning but didn't know how to act on it." Too often, Mr. Hughes says, Muslims in America get the message, whether it's from their imam or from friends at school, that you can be Muslim, or you can be American, but you can't be both. "That's a false choice," he says. "To the extent that you can reinforce that—that you can be Muslim and American—I think that goes a long way." Alumna Kyle Zimmer’s nonprofit, First Book, is pooling the buying power of educators and families in need to change the face of—and the access to—children’s publishing. Novelist Thomas Mallon imagines what lies between the facts in the lives of presidents and those around them.